I feel like a widow – or perhaps a deserted faithful wife. All that time I watched the Tour de France, and now it’s gone. This afternoon I had to do some writing because there was no excuse. When I first came to Paris as an innocent wanting to impress, I assumed that everyone knew about the cycling. I used to rehearse sentences containing references to famous riders and pontificate about the possible outcomes for next year. Generally I was met with complete incomprehension. In the end I fell back on my support for Crystal Palace football club. It was as if the sun had risen, bathing us all in warmth. “Oh yes – Zay are in your second deeviziyoh – etc…” Here in St. Savinien I find that the tyranny of football has almost no grip. Most things that one mentions of the wide world are too far away, too dramatic, too foreign to contemplate. It’s wonderful. All the same I did a straw poll amongst a few locals as I prepared to blog. This bizarre DSK affair rolls on in New York. Now, as readers will know I like (and write) cop stories. You will also know that I had a Scotland Yard partner for a while and that his insights were illuminating. So – this Mr Big chap is accused of all sorts of sexual crime. This is serious. We are talking years in jail here. I can’t believe that I saw the accuser giving her evidence on TV in advance of the trial. I just can’t believe it. What is going on here? The USA is a civilised country with a belief in justice and a constitution enshrined in law. So what do the French make of it all? Bref – if he is guilty he must go to jail – BUT- maybe Obama is against Israel (therefore Jews) or maybe DSK wanted to change the world money system and there was a plot…or maybe it is just so far away and so foreign that it doesn’t matter. I just worry about what’s happening to judicial processes. It’s not a circus is it? Gifts today were of a further bucket of mirabelles (now frozen) and a wooden chopping board. I heard the angel of all beasts outside. It crossed my mind that some cat/pigeon/parrot was in distress. “Emma – We have found some chopping boards in the cellar – I am giving one to you and some to so and so and so and so.” An angel chose me! Sod the world – I live in paradise. 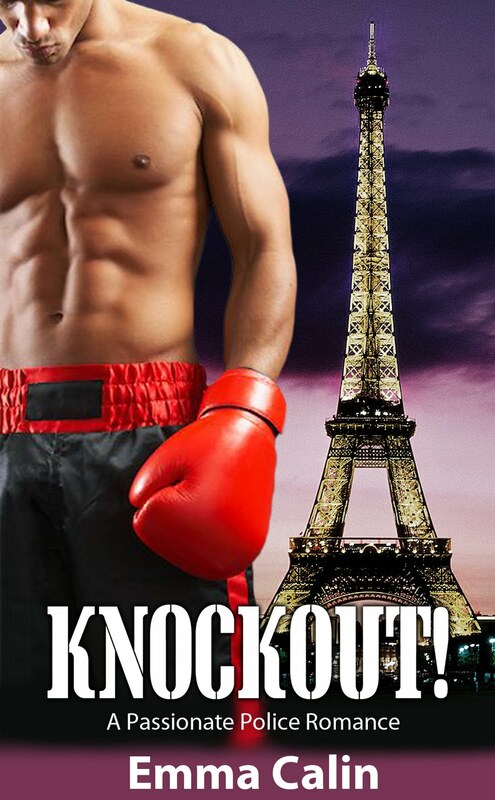 And finally – my new book cover for Knockout has been knocked out. It really is a knockout! Emma thinx: Angels can be smokers too. This entry was posted in Cycling, Emma Calin, Food, Romance Writing, Social Comment by emmacalin. Bookmark the permalink.